Lights, camera, and… action! Drama club is back and better than ever. After a strong year of performances last year, the club is ready to go above and beyond this year. Susan Cinoman, the Director of Theatre, has been in charge of Drama Club ever since she was hired. She was originally hired to be the theatre teacher, and now also teaches acting class. Since being enlisted in the Woodland family, Cinoman has witnessed the club grow from a small dozen to now over 65 members. Cinoman took an interest in drama at a young age. In her time not spent at Woodland she was a writer for The Goldbergs on ABC. Cinoman will not direct a fall event. In fact, this fall, there’s a first for Woodland- a student directed and student ran play. Cinoman steps down to give the students a chance to be in the leadership role. Any potential audience members of the show are welcome to suggest a musical/play they would like to see, Cinoman notes that “Bye Bye Birdie” is a potential option. “Once the show is set in stone, rehearsal is after school everyday for 6 weeks and most hours on Saturday,” Cinoman vocalized. The best way to gain teamwork and trust, according to Cinoman, is to just practice the shows with one another over and over again. “Rehearsal is a trust building exercise in its own,” Cinoman said. 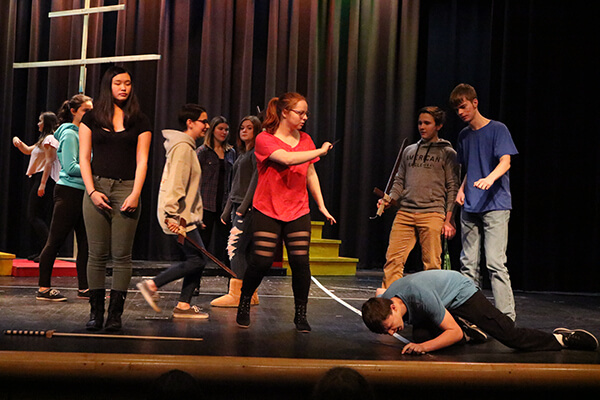 Drama club relies on a lot of patience and teamwork to make sure the shows are amazing. Are you interested in joining Drama? See Susan Cinoman in the auditorium for more information. Remember: if you join drama club you do not have to perform in the shows. It’s student run most of the time, and you can do whatever you are comfortable with, including partaking in the plays, or simply improving your acting skills. Who Are the Three O’Clock Losers?